A strongly scented ‘Spencer’ type with large, ruffled blooms. This orange-pink variety is a vigorous climber with long stems that make it ideal for cutting. Probably the nation’s favourite! These beautifully scented blooms make dwarf hedging or can climb up trellis and are super cut flowers. We know the sweet pea has a special place amongst our gardeners’ affections and we’re delighted to offer a huge range of varieties to you. 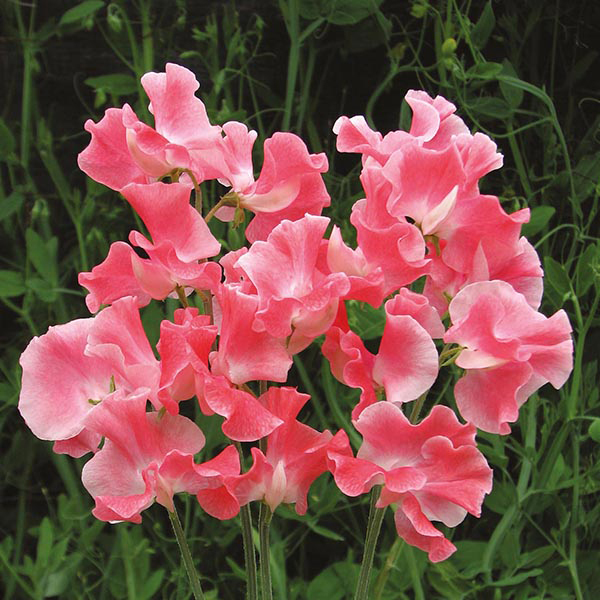 Nothing can beat the sweet pea for all round performance - garden decoration and wonderful fragrance in the garden and the vase! Sow indoors for surest results, January-March or September-October, 1.5cm (½") deep, 5 seeds per 12cm (5") pot of compost. Water well and place in a cold frame, greenhouse or cool windowsill. A temperature of 15°C (60°F) is ideal. Keep moist. Seedlings usually appear in 12-21 days. Pinch out the growing tip, when two pairs of leaves have formed, to encourage bushy growth. Gradually accustom young plants to outside conditions (avoid frosts), before planting out into well-drained soil, March-May, 30cm (12") apart. Or, sow outdoors for ease, April-May, where they are to flower, 1.5cm (½") deep, directly into finely-prepared, well-drained soil, which has already been watered. Sow 2 seeds together, every 30cm (12"). Remove weaker seedling, which can then be transplanted. Seeds sown in autumn generally flower earlier the following year. Flowers: May to October. Pick blooms regularly to prolong the flowering season.